Joe Miner, CPA, joined the UMMC team as a senior accountant in our Leesburg office in October 2018. 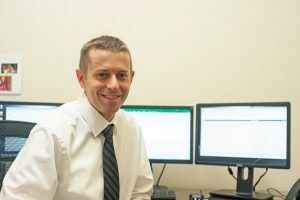 He came to us with more than 13 years of experience in public and private tax accounting and holds an accounting degree from Grove City College in Pennsylvania. He serves individual and business clients in the areas of tax preparation, tax planning, and accounting and is a member of the American Institute of CPAs and the Virginia Society of CPAs. Joe lives in Northern Virginia with his wife and their two children. In his spare time he enjoys spending time with his family and reading.